Queen Elizabeth marked 50 years on the British throne on Wednesday, breaking with tradition to carry out a public engagement that harks back to her father's death following cancer half a century ago. Elizabeth normally spends Feb. 6 with family at Sandringham, the royal estate in Norfolk, where her father died half a century ago of complications from lung cancer. This year, however, she agreed to attend the opening of the $1.7 million Macmillan Center for cancer treatment, at the Queen Elizabeth Hospital in King's Lynn, about 100 miles north of London. Red, white and blue Union flags fluttered across Britain to mark the anniversary. A 41-gun salute at noon in London's Hyde Park was followed by a 62-gun salute from the Tower of London an hour later. 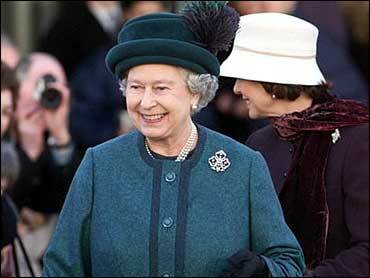 In an anniversary message on the royal Web site, the queen thanked her subjects for their good wishes. "This anniversary is for us an occasion to acknowledge with gratitude the loyalty and support which we have received from so many people since I came to the throne in 1952," she wrote. "It is especially an opportunity to thank all those of you who help others in your own local communities through public or voluntary service." And she added, "I hope also that this time of celebration in the United Kingdom and across the Commonwealth will not simply be an occasion to be nostalgic about the past. "I believe that, young or old, we have as much to look forward to with confidence and hope as we have to look back on with pride." Princess Elizabeth was 25 in 1952, when the sad news from home cut short an official trip to Kenya. Her father King George VI had been ailing for months and died in his sleep at Sandringham. Her husband, Prince Philip, told her during a visit to a remote game lodge in Kenya that she was queen. Coded telegrams from Buckingham Palace did not get through, and reporters recalled how the royals relied upon news reports for information about the king's death. The black-suited Elizabeth cut a slight and wan figure as she returned to London to be formally welcomed to her new role by then Prime Minister Winston Churchill, Britain's wartime leader. This summer, concerts and parties are planned to celebrate Elizabeth's Golden Jubilee and the queen, 75, has a travel schedule filled with visits around Britain and to other countries in the Commonwealth of its former colonies. But Accession Day is a sadder and more personal occasion. George VI had won the respect and affection of his subjects after he took the throne following the abdication of his older brother Edward VIII, who stepped down to marry the American divorcee Wallace Simpson. George and his wife Queen Elizabeth  now the 101-year-old Queen Mother  were a steadying presence through the war years. Older Britons recall how the couple stayed in London through the Blitz regularly visiting the neighborhoods ruined by German bombs. Britain was still drained and depressed by the war wen its beloved king, a heavy smoker, grew ill and died at 56. Rationing remained in force and the economy was in tatters. "During these last months, the king walked with death as if death were a companion, an acquaintance whom he recognized and did not fear," then-Prime Minister Winston Churchill told the House of Commons. The accession of the glamorous young queen with her handsome husband, Prince Philip, and two small children helped usher in a more hopeful time. Elizabeth's reign - already among the longest in British history - has seen major changes visited on the role of the royal family. Despite the sometimes embarrassing and painfully public antics of Elizabeth's children, support for the monarchy remains strong. Two thirds of Britons rated the queen and her family hardworking and highly respected in a MORI opinion poll of 1,000 adults in December and 70 percent wanted to keep the monarchy.